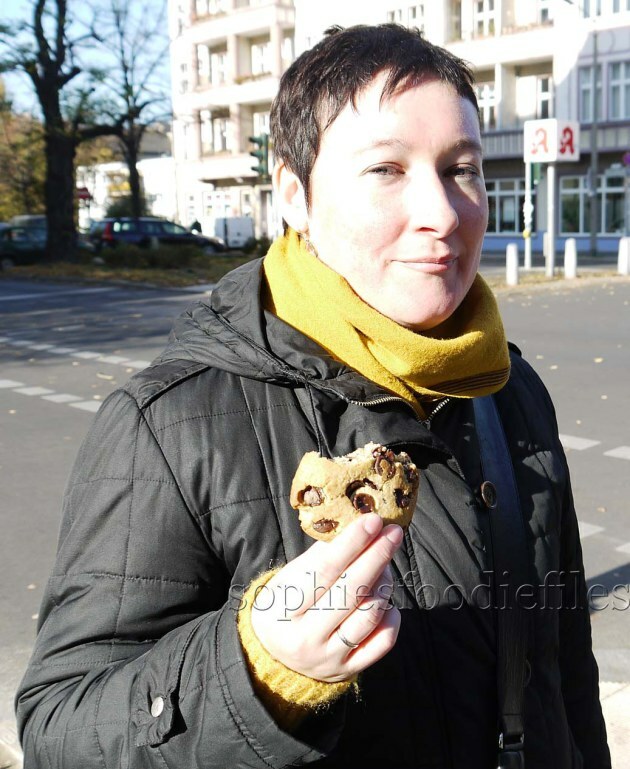 Me, Myself & I in Berlin snacking on a vegan chocolate chip cookie! I love to cook in general. I inherited my cooking skills from my late paternal grandmother. I cooked & baked with her when I was little. She also had a large veggies & flower garden. I am a lot like her in different ways. She was my moemoe, my inspiration in all things in life. I also love to go to museums, photo exhibitions & art exhibitions. I also love to travel & sleep in. I love different kinds of music, from classical to jazz & metal to hip hop. In the last years, my recipes have been featured online on websites like multiple times with many recipes on Australiancarobs.com, Chocodelic.nl, with my breakfast smoothy & also in their newsletter, I was featured 22 times on Instructables!!!! 2 of my photos are used & published in an online internet site called 60 by80, Berlin section. Also, another Berlin photo was used on a Dutch Website about Berlin! My famous Jerusalem Artichokes Latkes were featured on an American website, to celebrate Hannukah, on December 22nd 2016 HERE! I was also featured on a website for vegans/vegetariens aka veggie boards & they praised my vegan gluten-free strawberry puddings! I was also featured & interviewed by my good friend Elaine at the wonderful healthy foodblog: Foodbod. You can read the interview here! And with my Nut Seed Granola, they rewrote my recipe for the American readers! Recently, I am featured again with my Lentil Avocado Spread Wrap! Ooh yes! They rewrote my recipe a bit too! Since the end of December, I made my 1st E-book called: Healthy Vegan Christmas! You can download it if you subscribe to my blog! It has 10 new all vegan recipes in it & 8/10 are also gluten free!!! Enjoy! Welcome to my blog & enjoy it! Here are some tasty pictures to show you a bit the kind of foods that I make! Just click onto the pictures to go directly to the recipes! Rye spelt wheat sourdough bread with roasted hazelnuts! My E-Book: Healthy Vegan Christmas! Me, enjoying some excellent food in Kok au vin, Bruges! Brussels sprouts smoked bacon spelt pasta! Stay Tuned! If you liked this post & want more of them, join 2,000 followers! Subscribe by email! It is free! hi! thanks for stopping by my blog to say hi. I can see why your blog has won the awards you have. What a lovely blog. Love your blog! Very nice setup and so many gluten free recipes. Especially like you Christmas special. Hi Sophie, Thanks for stopping by Foodness Gracious, I look forward to checking out your blog!! Hello There. I found your blog using msn. This is a very well written article. I’ll make sure to bookmark it and come back to read more of About Sophies Foodie Files . Thanks for the post. I will definitely comeback. My spouse and i have been really relieved that Chris managed to complete his preliminary research because of the precious recommendations he acquired out of the weblog. It is now and again perplexing to just happen to be releasing tricks which some people could have been making money from. And we also fully understand we have the writer to thank because of that. The illustrations you made, the easy blog menu, the relationships your site give support to foster – it’s got all terrific, and it is making our son and us imagine that that idea is satisfying, and that is exceptionally mandatory. Many thanks for everything! Love your recipes! It’s do nice to connect with far away foodies isn’t it? I really love that photo of you on this page! Thansk so much, dear tammy! I found it kind of cool myself! Wow! You have so much of variety in your recipes! wonderful blog! Thanks sophie! Thanks for following my blog. I hope you enjoy trying out some of the recipes and if you do, please let me know how they turn out. You are welcome! Welcome to my blog too & enjoy your time here! My grandmother was a wonderful baker and cook too, and I learned a lot from her. I love the diversity of recipes and travel stories on your blog! Glad I stopped by for a little visit. Thanks so much, sweet laura! That makes me very happy: yeah! 🙂 It will be my 65th award! Thanks so much, my friend! 🙂 Yeah! Thanks & welcome to my blog too! Hope you enjoy the journey! You have a great Blog here, from time to time (if I may) I’ll print your recipes and make some of your dishes. I’ll also be showing my eldest son your Blog, I think it will help to inspire him to continue with his. Hi Sophie, thanks for stopping by my blog! I just had to come by and check out yours and I love it! I lived in Holland for a year while at University and have visited Belgium a few times so some of your recipes look very familiar. I can’t wait to get regular (and tasty) updates! Nice to meet you too! 🙂 Happy reading & tasting! Thanks so much, Urbanfoodlover! yeah! It made my morning so good! 🙂 Happy dancing now! Oooh,…A big thanks to you! 🙂 You have made my morning!!! Yes!!! Thanks & welcome to my blog! Thanks so much! I am happy now! 🙂 I still have to write bout my other awards from you !!!! Hi Sophie, thank you for stopping by my blog and liking it so that I can discover your wonderful creations! Expect me to drop by often. I am following! I was diagnosed with celiac four years ago. Was on a gluten-free diet exclusively until i went to Ireland and indulged in Guinness and found that I can cheat without repercussions. I’m about 90% gluten-free now. So I’m always looking for some good gluten-free recipes and advice. Oh, and I also have a daughter-in-law who is a vegetarian. Happy cooking! Ooh,…that’s too bad. 😦 I lived 1 year GF & boy that wasn’t easy at all! 🙂 Now, I can digest gluten but I prefer GF pasta still though. I challenge myself sometimes to make foods GF to learn new things. I can digest spelt & light spelt flour. Wholemal spelt flour I can’t digest anymore! Welcome to my blog & I hope you & your daughter will love it here! 🙂 Bye! Pleased to meet you Sophie… which is a name derived from Sofia (Greek), meaning “Wisdom”. I love the name, because I have a son and a sister whose names also mean “Wisdom”, but in two other languages. I am not a vegan, but I do appreciate and respect people who ‘are’ and present varieties of recipes which put us carnivores to shame! Thank you for visiting my blog which directed me to your fabulous blog. I’m now a fan! 😀 Fae. I just visited your blog a few times & love it too: A cool video blog too! Yes! Thanks! 🙂 You made my day! Hi Sophie, I have nominated you for the Sisterhood of the World Bloggers Award and the Super Sweet Blogging Award! You have a wonderful Blog Sophie with so many delicious recipes. I’ll have to look through more often. Hi Sophie! I’ve noticed that you comment on a lot of blogs I follow, so I wanted to check out your blog. I love that you have a lot of vegan recipes. I’ve been vegan for a year and am always looking for new things to try. I also like that your blog is easy to navigate – some blogs aren’t. Great blog, I’m so happy to have found you! Hey Sophie, I just nominated your awesome blog for a bunch of awards! No pressure to do anything but bask in the recognition, but you’re of course welcome to spread the award love if you choose. Just link back to me (the nominator) and post the badges, as well as nominate some awards of your own. Love following your blog – you really are plating up some fabulous dishes! Love your cute pic. You are adorable! Sophie, thanks for reading my blog and your kind comments. Very impressed with your creative vegan recipes. Thanks so much, Iain! I am not a vegan but do cook, bake & eat vegan 5x/week! 🙂 Thanks so much! Enjoy my blog! I enjoy the twists you give healthy food! If you don’t mind may I link your page to my blog to direct people to your great recipes? Oh my gosh Sophie, your food pics are making me hungry! I can’t wait to start browsing these recipes. WOW! I have never seen so many healthy recipes in one spot, I can’t wait to explore your blog! Thanks & welcome to my blog! Hope you enjoy my tasty recipes! Hey Sophie! I just stumbled across your blog and I already LOVE it!!!! All of your photos and recipes seem divine and I know that I’ll be making MANY of them soon 🙂 So glad I found you! I love the food already! Funny I love cooking too and we are namesakes! Hi Sophie — I’ve nominated you for the Liebster Blog Award (http://bit.ly/12Gwfc6)! I love your blog, creative recipes, and friendly and approachable writing style. I truly appreciate you as one of my blogger friends, I always look forward to your comments and feedback. Hello, Sophie! Nice to meet you. I’ve known your blog from Fae. 🙂 Thanks for following my blog. And I like Linkin Park, too. 🙂 Looking forward to your new posts. Have a nice day. Oooh thanks so much! 🙂 x yeahh! Congratulations Sophie! Three stars ☆ ☆ ☆ for Blog of The Year 2013 Award! Enjoyed your blog immensely as food blogs are my favourite kind :). I am gonna show your blog to my dad who spent some time in Belgium decades ago. One you are done with your cooking chores today, do check this other blog http://www.acuriousarmywife.wordpress.com, where I write about life as an Army wife in India. Cheers! Dear, dear Sophie! You deserve so many awards and accolades for your blog that I won’t be able to list them here. However, as a token of appreciation for you and your wonderful blog, I have nominated you for the Versatile Blogger Award. Please take a look at the nomination here: http://wp.me/p2WqlF-VV. I will & welcome to my blog! Hope you enjoy the ride! Everything looks delicious – great to learn more about you! I was just in Belgium last month and absolutely adored it! Ï’ve started helpng my Dad with his garden this year. Hard work but so rewarding! I love your blog and already seen so many interesting recipe, especially for home made nut milks which I adore! Thanks. 😀 Enjoy the ride. Yes, you do that! Enjoy the delicious ride! Have you thought of opening your own restaurant? You have everyone that reads this blog across the world mouths watering with each post. I’m not sure how risky it would be to do something like that in Belgium but if anyone can do it I would think it would be you! Ooooh,…Now you are flattering me, but my recipes are not all typical Belgian! Thanks for the follow, which led me to your blog. I look forward to reading more and trying out some of your recipes. It great to get vegan and gluten free ideas for food. what a lovely blog, I’m glad I found it today! I love the variety and the healthy twist in your recipes. Hey Sophie! I have been a follower of your tasty blog for a while now! I really enjoy your different tasty recipes! Keep on going on just like this! 🙂 Many greetings from Norway! Hi Sophie, excellent blog! We have several tastes in common – good bread, Spanish olive oil (Carbonell), and Stonemanor English store. I don’t blog often but I am currently preparing a piece on coffee and coffee bars in Brussels, if you have any suggestions I will be happy to credit you and link to your blog. I will be checking in more often in future. Timethief recommended your blog to me and I’m glad I’ve come to look. I can’t wait to try a few of your recipes and I’m looking forward to reading more. We holidayed in Belgium for two weeks last September, with a week each based in Bruges and Brussels. We enjoyed it so much and I would love to come back again one day. Hi thanks for following my blog. Look forward to exploring your blog and following your interesting reads! We really love your cool tasty blog here, Sophie! Hi Sophie, thank for coming and hanging out at my blog with me. Thank you so much for following my blog.You have a lovely blog with amazing pictures.Will dig into your recipes one by one. Thanks so much, dear Anuradha! I really love, love your blog, tasty recipes & you write with such enthusiasm! Thanks so much, Jessica! Enjoy! I find your blog interesting! I nominated you for mystery blogger award.